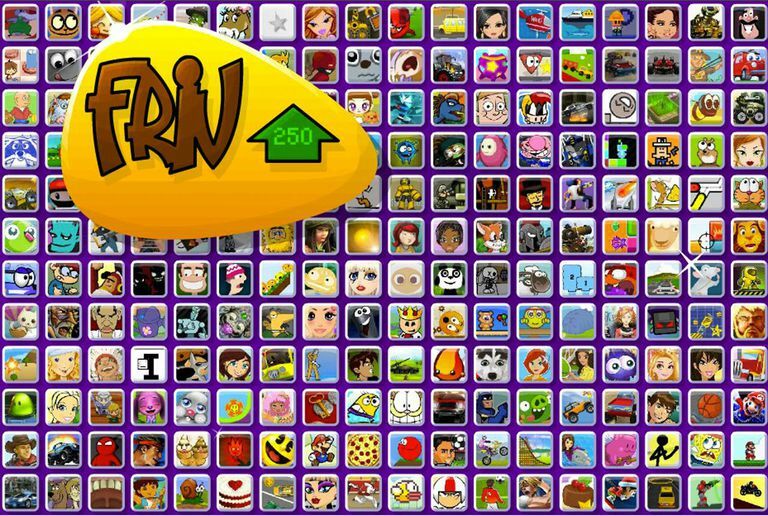 Friv isn't a single website: It's a network of websites filled with hundreds of free Flash-based games. These sites offer a massive collection of free casual games that are easy to play. Because the network requires no sign-up, lots of people sample Friv gaming sites and become instantly hooked on the colorful, addictive games. To play games on the Friv network, download and install Adobe Flash Player. When you visit Friv.com, you're welcomed by an abundance of tiles. Each tile on the homepage represents a different game. Your mouse cursor is much larger, but this effect goes away when it moves outside of the browser window. To find out which games correspond to the tiles, hover over a tile to display the title of the game under the FRIV logo. Select a tile to start playing. When you arrive at the game's page, you may be prompted to enable Adobe Flash Player. If so, click the puzzle piece to activate it. Since the games are created using the Flash programming technology, it can take a fair amount of time to load a game, and it requires a computer that has the latest version of the Adobe Flash player installed. Some games even include links to instruction manuals or walkthroughs. Click a link to view these instructions. After the game loads, you're ready to start playing. While the Friv network includes educational games for small kids, all Friv games are appropriate for people of all ages to enjoy. There's no graphic violence or adult themes in any of the content. Nonetheless, Friv websites are also popular with older kids, teens, and adults because the games provide a great way to relax after work or school. At last count, Friv claimed to have more than 1000 free games on its network. While Friv games are obviously not Xbox or PS4 quality, some have impressive artwork and level designs. The graphics and controls are generally simple, and but some titles offer a challenge to veteran gamers. Friv websites have a super simple interface designed to make it easy for young people to explore its wide variety of games. That said, navigating Friv websites and finding specific games can be a challenge. When you find a game you like, bookmark the web page so that you can easily get back to it later. On the Friv.com homepage, select Friv + in the lower-right corner to browse more games. Unfortunately, Friv.com does not have a list of all games organized by category; however, you'll find game lists on other websites. There are dozens of websites with ‘friv’ in the domain name, but not all of these websites are legitimate. Stick with the sites listed above to avoid malicious content. Friv has a mobile games website. Visit the site on your Android or iOS device and tap the game you wish to play. Since Flash games are designed to run in a laptop or desktop browser, most other Friv games are not compatible with mobile devices. Even if a game loads, you may be unable to play it since the games rely on keyboard controls.